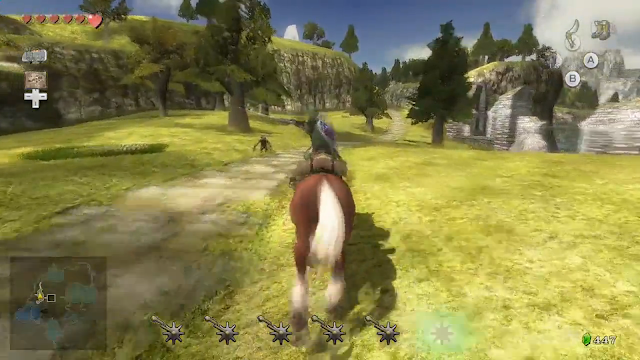 I’m so glad that Nintendo decided to remake The Legend of Zelda: Twilight Princess, and bring it to the Wii U. While it’s one of the more polarising entries in the series, I’ve always found it to be a fascinating, grand epic, of a game. And for someone like me, who does take their fantasy adventures seriously, the more mature tone of this game, and its deeper sense of lore and meaning, has always made it a personal favourite. Related reading: Of all Zelda titles, Majora's Mask is the most thematically similar to Twilight Princess. Matt's full review of the 3DS re-release here. Aside from Majora’s Mask, this is one of the darkest and most unrelenting visions that the franchise has thrown up. And perhaps that is, in part at least, why it has been so polarising; it’s not the exciting, charming, adventure that Skyward Sword or Wind Waker is. It’s not as groundbreaking as Ocarina of Time, and the gameplay itself isn’t as innovative as Majora’s Mask. Twilight Princess is a classical Zelda game, only aged and more artful with its thematic depth, and that’s something that I can fully appreciate wouldn’t sit as well with some of the more traditional Zelda fans. As I started to play Twilight Princess again, one of my immediate thoughts, upon first entering the Twilight Realm and witnessing the dark and decrepit, near-gothic world, was “here I am in The Legend of Zelda: Souls Edition.” Which is of course silly; the original Twilight Princess came before the Souls games, and in no way does it play like From Software’s games, but the more I sat and thought about it, the more I realised that in some ways the themes really were quite similar. “Tell me… do you ever feel a strange sadness as dusk falls? They say it’s the only time that our world interacts with theirs. … The only time we can feel the lingering regrets of spirits who have left our world. As we quickly see after that, the twilight has become weaponised and turned into a corrupting force that begins seeping through the land. Link’s first task is to delve into the dusk and put a halt to its spread. It’s a story that from the very outset forces players to grapple with overwhelming loneliness and the misery that brings, and that is very much a part of the Souls experience, too. It gets darker from there, too. Though I don’t want to give away spoilers (despite the age of the game there are indeed people who haven’t played it, and shouldn’t have it spoiled on them), this is a tale that has no issue with delving into emotionally complex issues; you’d never expect to see a Zelda game deal with mortal sacrifice, for example, but it’s a central motif of this one. Related reading: The Gamecube Zelda, Wind Waker, is also available on the Wii U. Clark's full review of that port/ remaster. 2) They’re also reduced to mere puppets at the hands of the game’s villains. To the point of control through possession. It’s a clear allegory to the way that women continue to be powerful but only on the terms of men. With it being International Women’s Day this week I found this theme especially poignant, because the experience that Princess Zelda et al go through in the game is mirrored in what female leaders and CEOs too often need to cope with. That’s my reading of it, anyway. Yours will almost certainly be different. As with Majora’s Mask, when a Zelda game decides to be serious, it tends to be constructed with a keen eye towards artistry… and that means a lot of it is deliberately left open ended. 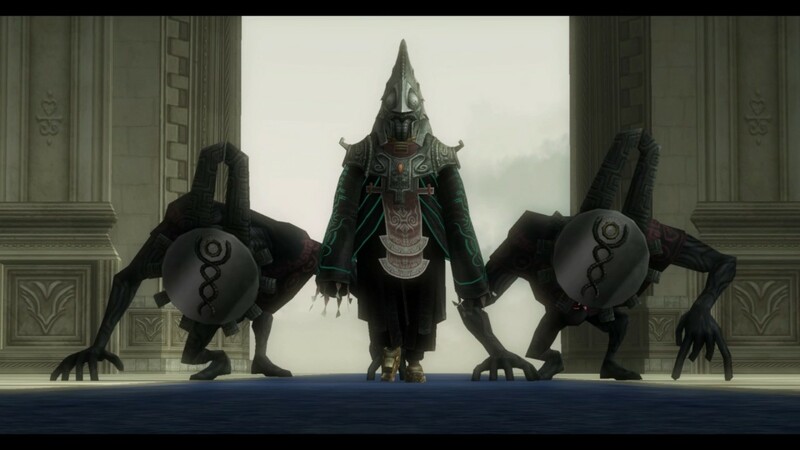 What each person sees, experiences, and interprets in the game will differ, and in another comparison to the Souls series, the triumph of Twilight Princess’ narrative has as much to do with what is not said as what is. The explicit narrative is really quite straightforward and simple, but those underlying themes take some unpacking, and for a game that is as large, and meticulous in detail, as this one, that’s a lot of unpacking you’ll have to do. So I come back to the art style, which I find to be so particularly striking. 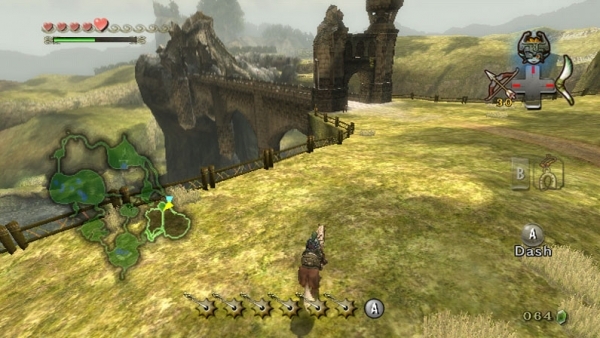 The pseudo-gothic architecture and design of the monsters really benefits from the work that has been done to bring the game into the HD era. Though the game suffers from the standard issues with HD remasters – a relatively low polygon count in characters giving them sharper features than we see in genuinely modern games, and relatively flat and empty environments – the team at Straight Right, who previously brought Mass Effect 3 and Deus Ex: Human Revolution, have done a really great job in enhancing the tone and atmosphere that the art direction was originally aiming for. There are moments where the Wii U hardware can’t quite handle the complexity and scale of some of the larger environments at this resolution, but for the most part this is a visually vibrant and complex game, despite its age. What I’m less sold on is the actual work that’s been done in taking advantage of the Wii U hardware. I love Straight Right because it makes games that use the Wii U technology to offer an experience that is superior in every way to what is available on other consoles. I can’t play Mass Effect 3 on any other platform, for example, because I need that map on the gamepad and the ability to make tactical commands on it on the fly. Unfortunately Straight Right has shot rather straight with Twilight Princess. The gamepad’s screen is handy as a map of the environment, useful as the item screen (saving you from pausing the action on the main screen every time you want to swap the tool that you’re using), and the ability to play the game on the gamepad is great for people who have to share the TV with other people. And, realistically, I don’t know what else could be done with it, but it’s nevertheless a very vanilla implementation and I’m used to seeing Straight Right add a completely different gameplay experience into the mix when it ports a game to Wii U. But that bellyache aside, Twilight Princess does control beautifully on the Wii U, and there are some nice little amiibo additions in there for people who want to add some extra challenge to the game. 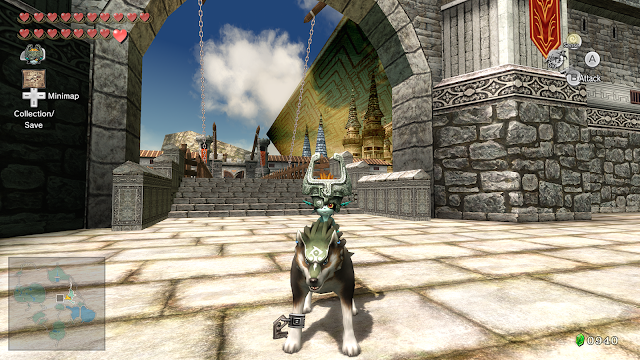 In particular, I’d suggest that the unlock that the Twilight Wolf amiibo provides – a full bonus dungeon that means the figurine almost behaves like physical DLC - is essential. 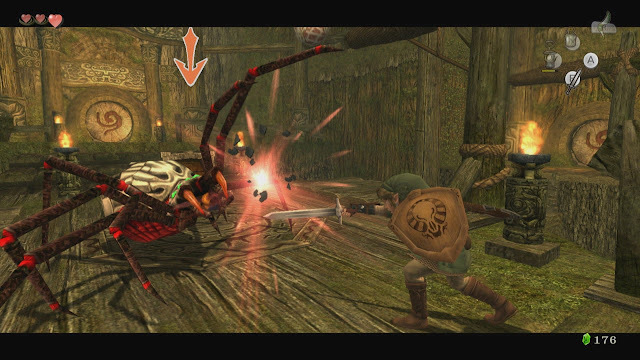 Perhaps the greatest let down with Twilight Princess is that, for a game that really does take risks with the Zelda formula in the way it tells a story, the actual design of the game is almost painfully safe. Nintendo has never quite managed to break away from the gameplay loop that Ocarina of Time really perfected the first time around for 3D Zelda games – you’ll go into a dungeon, solve some puzzles until you collect an item, which you’ll use to defeat the boss of that dungeon. From that point you’ll be pointed to the next dungeon and away you go. Rinse and repeat. It’s a workable formula, and even an enjoyable one. Thought there’s a point where each player will find that the puzzles in Zelda games become too easy because they’re variations or even straight-out copies of puzzles they’ve experienced in Zelda games they’ve played previously, they never stop being entertaining. But it is difficult to shake the feeling that Nintendo does need to try something very different with this series. It’s not fair to expect a port of a previous game to bring that innovation, of course, but it’s a legacy issue of the series that I’m slowly losing patience for. 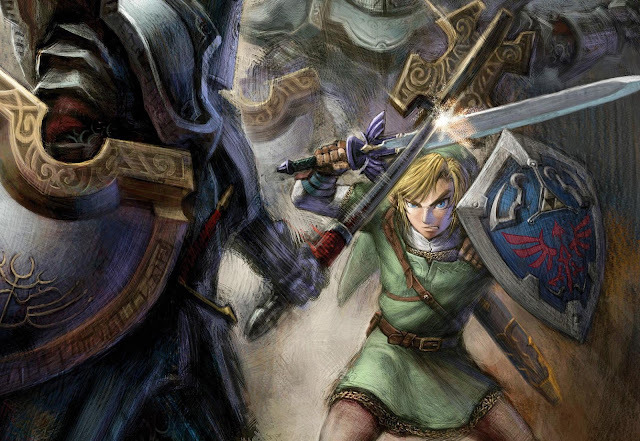 Related reading: And for a very different Zelda experience, check out Hyrule Warriors. Brad's full review here. It’s quite clear that Nintendo intended this remaster of Twilight Princess to fill in a Wii U release schedule that is looking less and less likely to include a new Zelda title before the NX launches. I don’t have an issue with that in the slightest. It was a great game back when it was new. It’s a great game still. Strong narratives don’t age, and this one has a strong story to tell. Throw in quality port work that gives the art direction the detail and clarity that it really deserves, and Twilight Princess is a classic that has scrubbed up well enough to be a worthy Wii U title in its own right. If you enjoy my writing, please consider backing me on Patreon. The more backers I have, the more writing I'll be able to do!